“Something should be done, but I don’t know where to begin… Maybe the problem is that there are too few people who will join forces for the good cause.” 1. 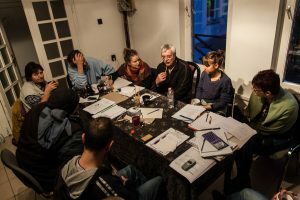 The School of Public Life is a community-based education and research center supporting the active participation of socially disadvantaged people living in Hungary. The goal of the participatory action research project entitled “When is it time to act if not now?” was to support the work of the Hungarian housing movement by looking into a formerly invisible part of Hungarian social history: the struggles of people living in housing poverty to achieve humane and socially adequate living conditions for themselves, their families and their communities. The idea of this research first came up at the time The City Is For All housing advocacy group was founded, which also gave birth to the School of Public Life. When the former was formed in 2009, activists from Picture the Homeless from New York were invited to provide training for would-be The City is for All activists. Our American activist peers had many inspiring stories from home about how oppressed and marginalized people were able to change their circumstances through social struggle and perseverance. We felt that Hungarian activists could also greatly benefit from such examples to give them strength and provide lessons for their own struggles. However, we also realized that it was extremely difficult to come up with positive historical examples of housing movements in Hungary. The reason for this was not clear at the time: have these movements not existed in Hungary at all, or they have existed but we just simply don’t know about them? For a long time, we had hoped the latter was the real answer. The City Is for All has since developed into a larger movement and several other organizations have come to life to address the housing crisis in Hungary. The aim of the “Time to Act” research project has been to support this broader struggle for housing by showcasing its predecessors and support the formation of a collective identity for today’s activists. In fact, the research has confirmed our hope that civic activism and radical action have a long-standing tradition in Hungary, too. However, as these struggles are not part of official school curricula, they do not enter our everyday conversations or media discourses. As a result, we get the false impression that they have never existed at all. Our research set out with the hope to shatter this illusion, and we feel that we have been successful: our work today for the right to housing is rooted in a rich legacy of activism that has also had tangible results, so our struggle today is definitely worth pursuing! The movements and organizations we uncovered operated in many different ways and used a wide variety of methods. Many of them relied on self-help as people in housing poverty took their fate in their own hands and created places to live for themselves, even if this involved going against the law. This involved occupying caves and building huts or shacks on empty land. Other movements fought to force the state to ensure resources for everyone to live in proper housing. Examples of this approach include the rent strikes of the early 20th century and the so-called ragged revolution of homeless people following the regime change of 1989. Even if the methods were different, their goals were very similar: to provide adequate housing and dignity for everyone, including people living in poverty. The right to research, as put forward by Arjun Appadurai (2006), means that everybody has the right to conduct research regardless of their social background. That is, research is not the privilege of a small elite, who earn the right to do research by having the right kind of pedigree. Research also belongs to those whose social status has not made it possible for them to gain the qualifications required by academia. Participatory action research (PAR) means putting the right to research into practice by creating the opportunity for socially disadvantaged people to interrogate their own reality, reflect on their experiences gained through the process, and take steps to improve their situation. In PAR, research itself is a tool for social change. Away from the searching gaze of the elite, research becomes an instrument of social critique and change from the bottom up. In the process, it is not only the social hierarchy that changes but also the participants themselves. Paulo Freire (1970) states that social change is a pedagogical process through which the members of oppressed groups first have to humanize themselves – that is, to learn to see themselves (again) as fully-fledged human beings and citizens. Through research, participants analyze and understand the structural roots of their own oppression and try to find ways of getting rid of them. As one of our members put it, participatory action research is an equation with at least four unknown elements. 1) Participation. This element seems somewhat obvious, but what if there is nobody able or willing to do it? The depth of participation is another question – just how intensively and with what impact do co-researchers actually participate in the process? 2) Research. About what, where and how do we do research, and with what purpose in mind? 3) Action. This one remains unknown for a long time throughout the process. We have no idea at the beginning where exactly the research will take us and what it will develop into, but we are sure we want to change the status quo. 4) Reaction. Even more unknown. The feedback given by outsiders and the social impact of the research are unforeseeable. Participatory action research is a living, organic, self-generating process which we are a part of, and which becomes a part of us. There is one core certainty at the heart of all participatory action research: the human being – however deprived, unschooled, disabled, or homeless – is of utmost value. Our research project was based on the principles of deep participation (Billies 2010), which means that all researchers – regardless of their academic background – have participated in all the aspects of the study as active and fulfledged members. In deep participation, we make all research-related decisions together as a team including the main themes of the research, the research methods, the division of tasks and the norms of group, etc. While all these requirements were fully met in the course of our research, it is important to note that the original topic of the research (the history of housing movements – however defined – in Hungary) was formulated not by the full research team but by the two people who originally initiated the project, both activists of the City Is for All and founders of the School of Public Life. The Time to Act research started in January 2015 and finished in June, 2016, with the participation of nine people who were homeless or living in housing poverty and two trained social scientists. Those members of the research team who have first-hand experiences of housing poverty all decided to join the team for the same reasons. We all live in housing poverty. We all want to understand how contemporary Hungarian society works. We all want to improve our own conditions. We are all willing to take action. We are not sure what to do, so we use trial and error. We try to understand how the housing situation in Budapest could have reached an all-time low by today. We try to find similar situations in the history of the city. We hope that by understanding the events of the past and highlighting the virtues and shortcomings of earlier movements, we can adapt all this to our present needs and help emerging movements learn some useful lessons. We started our work with a three-day training, where we learned about the School of Public Life and got to know each other. We also learnt about basic methods of historic and social scientific research and about one another’s housing situation. We even went to visit Kassák Museum and played group games together. We continued our self-education even after the training as we visited various research sites to get to know the venues and sources from where we can get our information. We visited several archives, museums and libraries, where the guides were always very helpful and supportive. These visits proved very important for our research and we established excellent relationships with many of our helpers. Before starting the actual research, two important tasks lay ahead of us. One was to create a code of conduct for the team. This set of rules, formulated by the team and accepted by all the members, created a framework for the whole project. In it we stated our norms, our behavioral rules and our expectations for ourselves. Teamwork is good but difficult. With the emergence of a group is the emergence of a whole new entity as well: group dynamics (see Tuckman, 1965). According to the laws of group dynamics, each new group goes through the stages of forming, storming, norming and either performing, if the previous stages were fruitful, or adjourning if the group falls apart before actually functioning properly. We were lucky. Our group worked fruitfully for 18 months, and even though some of us dropped out, we maintained an atmosphere of love and respect all along. Our code of conduct, it seems, proved feasible. Another important task was to agree on our common task – what are we trying to do exactly? We had to formulate the main, overarching question of our research. Our topic was set: housing movements in the 20th century. Right! But what exactly is a housing movement? At the beginning of the research, we created our own definition of a housing movement. For us a movement is a bottom-up grassroots effort that fights to solve the shared problem of a social group against the powers that be using advocacy and activism as its methods. By extension, a housing movement is something that fights for affordable and/or adequate housing, even if this goal is not always formulated explicitly. After we had our definitions, each researcher went on to find traces of housing movements in the history of Budapest Whatever we found that seemed to match, we brought it into the group to discuss if it really matched our definition and decide if we should dig deeper into it. Following the initial training, we met up every Thursday for three hours at the Auróra community center to discuss the developments of the project, share with each other how each of us were doing with their own topic, help one another and set the tasks for the next week. The agenda for each meeting was drawn up by the research coordinator, Tessza, based on what we had previously discussed. We always started with our shared tasks, then gave everyone the opportunity to tell us about where they were with their own, what new treasures they had found, what kind of help they needed etc. On each occasion one of us prepared sandwiches, coffee and snacks for the group. Each week also saw a different participant moderating the discussion, which we held by sitting in a circle so that we could all see one another. If anyone got a bit stuck with their own topic, they could always count on the others to put aside their own and see if they could locate articles, papers or photos that could help them move on. At the meetings, we constantly gave each other feedback on our presentations and writings, too. In April 2015 we had our first milestone meeting, when each researcher had to present and summarize the findings they had reached until then. These presentations went very well and gave us impetus for our further work. We could relive this pleasure later at the Symbiosis Festival of Cultural Anthropology and also at the Corvinus University, where we presented our findings to both academic researchers and the general public. 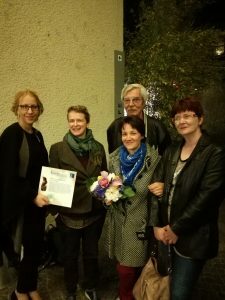 In September that year, we presented our work again at the opening ceremony of the School of Public Life for the academic year, and in October again at a sociology conference in Szeged. Of course, we had our low points, too. We often needed fresh impetus and new insights. Already at the first meeting, several participants expressed their worries over what happens if we run out of enthusiasm. But back then it was unimaginable. Why would we? Later it turned out that if not enthusiasm, strength can really run low. The very point of this research project was that it was carried out by people affected by housing poverty themselves. Who cares about research when our house is about to be flooded by mud? Well, as it turned out week in, week out, all of us actually did. Because we had undertaken something and we had a task ahead of us. We belonged somewhere. We were surrounded by others who knew exactly what it was like to have your electricity disconnected or have nothing to eat. The group made us stronger. We were now able to say that we were living in housing poverty and we were no longer ashamed of it. We were able to tell society face to face: it is not we who should be ashamed of our situation. We do what we can. We fight to survive. And we also research the history of housing movements. We try to find solutions. We want to show the world, including the cynics and those who are hostile that “we Hungarians” are not as passive and helpless as we might seem. If there had been strong and successful movements for housing before, why should we not have them now? People have always used natural caves and artificial underground holes and cellars as living spaces. In Hungary we find examples of these in many towns and villages, but our research was limited to Budapest, where there are three larger cave systems: under the Gellért Hill, in Budafok and in Kőbánya. All three of these had been used for dwellings at certain points in time, but we only have detailed descriptions of Budafok-Promontor, the most inhabited one. Budafok in the 19th century was mainly inhabited by wine-growers and small traders associated with wine production, along with quarry workers and agricultural day-laborers. Schwäbisch quarry workers had moved here attracted by the easy-to-work limestone, but the caves were also needed to create the wine cellars. The stone was mined from the surface by the creation of rectangular pits. It was these cavities of 4 or 5 meters in depth that first got to be used as dwellings, but sometimes they would start by creating smaller holes and selling this first batch of limestone, move in, expanding the cavity gradually from there. The newer holes were then sublet to even poorer people. “It is a full-fledged city under the surface, with regular street signs attached to the walls, and with tiny, unhealthy dwellings made up of just one room and a kitchen, sometimes 5 or 6 meters below the surface, which are known around here as ’masonry houses’ and are registered properly in the address registry. (…) In certain places, you walk along a street unsuspecting and suddenly there is this forest of chimneys emerging from the very pavement. This is how you know that there are people living underfoot, under the ground” (Szélpál, 1936). Although the creation of new cave dwellings was officially prohibited by the authorities in 1897, this had little or no effect at the time. In 1910 there were 636 cave dwellings in Budafok, with a total of 2698 inhabitants, which amounted to 24% of the population (Zsámboki, n.d.). In an article as late as 1938 in the daily paper, Népszava, we can still read the following: “Beyond the town of Budafok, near the cemetery, hardly a few meters deeper than the dead, there are 370 families living underground, with many small children – almost 7% of the entire population of the town.” The history of these cave dwellings came to an end with the housing construction campaigns of the state socialist period – by the end of the 1960s most of the cave dwelling were gone. Not all the dwellers were willing to move out, though. The last of them, Mrs. Győző Tóth, died in 1971, and it was in her former dwelling that the Cave Dwelling Memorial Museum was opened at 4 Veréb Street. According to the initial definition developed at the start of our research, occupying the cave dwelling can already be considered a kind of housing movement, since it involved poor people creating homes for themselves by breaking an existing law. As the people inhabiting the caves had trouble to make ends meet, they had no extra resources for organizing and expanding their movement. Yet it is also clear that they always resisted eviction and protected their rights against the authorities. The overpopulation of Budapest began with the so-called Great Compromise with the Habsburgs in 1867. Industrialization led many people to seek work in bigger cities. Despite the large influx of workers in the late 19th and early 20th centuries there was no such thing as a conscious housing policy in Budapest (see Umbrai, 2008). The housing reformers of the time – Imre Ferenczi and István Bárczy were the best known – tried to achieve public solutions to the crisis but with little success. As a result, the construction of new housing became the sole responsibility of private entrepreneurs. Around the turn of the century most industrial workers lived in low-standard, low-ceilinged, one-room-and-kitchen apartments heated by one cylindrical stove. Quite often, five tenants shared the little room, which opened straight from the courtyard of the tenement block, which meant that it got very little sunlight. Subletting was the only way to make sure the rent could be paid, so even beds were sublet, which added significantly to overcrowding. As Imre Ferenczi (1910) put it in one of his papers on housing, in a well-functioning economy an industrial worker would spend 15-20% of his income on rent, while in Budapest at the turn of the century this way as high as 30-33%. 1906 saw the deepening of the economic crisis: both rents and the price of food skyrocketed. By 1913, the rent for these apartments for industrial workers had gone up by 50-100%. One of the reasons for this was the fact that middlemen were inserted between the owners and tenants, increasing the possibility of usury. Usury, in turn, increased the tension by the fact that more and more tenants were unable to pay the rent on time, and thus the number of evictions also grew exponentially. The first phase of widespread protest was the so-called house boycott movement, which started in 1907, although we found some earlier signs of similar attempts as well. The boycott movement involved the tenants of a building with extremely high rents asking apartment seekers to boycott that particular house. As a result of this effort, many landlords were forced to negotiate with the tenants and sign collective agreements that curtailed their own rights (Gyáni, 1992). The relatively rapid and unexpected success of the boycott movement is due to three factors: 1) if an owner terminated a contract prematurely, the ensuing civil lawsuit could last for months, causing significant losses to the owner. Often, the loss generated by the absence of new tenants exceeded that generated by the initial non-paying tenants. 2) Because of the public conflicts, property prices went down in the affected neighborhoods, which made property dealers unhappy. The banks who had given loans to prospective owners also urged the parties to come to an agreement, for fear of losing their repayment. 3) Property owners proved unable to exhibit effective resistance against the boycott movement. They didn’t make up a unified political group, they were not prepared for lobbying, they were internally divided and they also depended on banks for money. In February 1909 the landlords in Budapest decided to enter a coordinated increase in rents. It was at this point that the boycott movement turned into a violent strike wave, with tenants sieging buildings and declaring their unwillingness to pay the increased rents in greater numbers. It shows the effectiveness of these rent strikes that municipal authorities were relatively quick to react. A so-called small apartment construction campaign was soon launched and legal regulations about tenant’s rights were also modified. The modification made it compulsory to sue tenants in court if the owner terminated a contract because of nonpayment. The lengthy and costly legal procedures motivated owners to seek agreements instead. The changes also brought an end to the practice of landlords appropriating nonpaying tenants’ belongings in their absence. By the end of the 19th century there emerged a significant group of artists who needed studio apartments or at least studios to work in. Their organized movement for better housing started in 1909, when four sculptors, Géza Horváth, Ede Kallós, Ede Margó and Ferenc Szeszák wrote a petition to Mayor István Bárczy. In it they asked for studio apartments to be built by the municipal authorities „in the sacred name of Art”. Forty other artists signed the petition (Nyikos, 2002). The idea of studio apartment construction was in line with mayor Bárczy’s program of small apartment construction, which created 6000 new housing units between 1909 and 1912. Young artists at the turn of the century faced the same kinds of problems as the tens of thousands other inhabitants of Budapest: they had no affordable or adequate housing. They decided to use petitioning to reach their goals, since in their case, actively turning against the dominant social classes would have meant existential suicide. Their advocacy tool was to make the powers that be realize that the knowledge and skills they possess serve the goals of the city or even the whole country. They offered their talent and creativity in exchange for proper housing and livelihood. Eventually they reached their goals, although initially only a handful of them could enjoy the fruits of their labors. However, the Artists’ quarter originally planned as a temporary solution for a ten-year period– still standing today, ended up serving as home for hundreds of people throughout the last century. The year 1920 saw a dramatic housing shortage in Budapest. The approximately 50 municipal homeless shelters housed thousands of people every night (Gyáni, 1992), and about 10% of the city’s population lived in a sublet, which often meant nothing but a bed (Győri and Sass, 2003). Budapest had grown into a fully-fledged metropolis, attracting huge crowds of industrial workers. They were especially hit hard by housing poverty. Many of them spent their nights on rented beds, and they also represented a big part of the population of fast growing slums. Self-construction happened in two waves. The first wave started in the early 1920s, when the moratoria on evictions and rent hikes were lifted and thousands of families were in immediate danger of losing their housing. The second peak of shack building took place during the great depression, when homeless and unemployed people erected their huts and shacks around the already existing slums. In the 1920s two types of people made up the population of slums, which was in total several thousand strong. Self-organized settlements were created when people squatted municipal plots and built their shacks (such as the so-called Little Jerusalem or Lepertown slums). Others were originally created by the state as emergency housing, but were just as run-down as the spontaneously built ones. State-built barracks were typically given names of the female members of the Habsburg dynasty, such as the Augusta, Zita and Maria Valeria settlements. According to a contemporary survey by János Szécsi ( 1963) slum settlements mostly housed married industrial workers with children. Most breadwinners were between 30 and 60 years of age, with greatly varied professional backgrounds from skilled workers, stonemasons and joiners, to washerwomen, tailors, cleaners, house painters, clerks, street performers, musicians and hairdressers to tilers, locksmiths, mechanics, carpenters and furriers. As for the most run-down of the settlements, however, a great many of inhabitants were unemployed or only had occasional jobs. Shack dwellers used many different forms of resistance and they were ready to protect their dwellings even from the authorities. This is well illustrated by the history of the so-called Ant settlement (Hangyatelep) in Pesterzsébet, just outside of Budapest (see Böröcz, 2009), which authorities tried to bulldoze for years, but the inhabitants always managed to stop them. It was only in 1934, five years after the original deadline for destruction that the municipal authorities managed to get rid of the shacks. Some of the inhabitants received financial compensation and temporary housing, while others moved to other parts of the city where they erected new huts. This kind of migration within the city was not only a form of struggle for survival but also a represented covert resistance. Even though the shack-dwellers of Budapest never organized themselves into a movement, their mere existence was a sore spot for the municipal authorities, and as living conditions steadily disintegrated, slum dwellers became more and more receptive to radical ideologies (Gyáni, 1992). Thus it is easy to assume that the authorities’ (often unsuccessful) efforts to eradicate the settlements were motivated by a fear of the power of the poverty-stricken masses (Nagy-Csere, 2010). The 1950s saw another increase in housing shortage in Budapest. By 1949 existing housing supplies were completely depleted, and in the wake of Stalinism the development of heavy industries was an overall priority, attracting tens of thousands of people to the capital. State companies owned apartments for their workers, but conditions were very strict. Workers had agree to give up their housing in 15 days if they left or were fired from the company or be evicted. At the same time, many company managers complained that this never actually happened as their former workers were unwilling to leave their apartments and the company had no real leverage to carry out evictions. Another widespread solution for the housing shortage was squatting. On October 23, 1956 Hungary erupted in a revolution against the Stalinist dictatorship. Although the main demands of the revolution focused on freedom, we find messages that referred to the housing shortage as well: “To help the disastrous housing shortage, we demand that the premises of useless state organizations and offices be turned into small apartments” (Temporary National Committee, 29 October, 1956). Thus people fought the revolution not only for the freedom of the press and for equality, but also for the resolution of the burning question of housing shortage. Having been fed up with the apartment allocation system of the 1950s and making use of the chaos surrounding the revolution, many people decided to grab a apartment for their family come what may. Most of the squatters were industrial workers, and thus belonged to the social group (supposedly) most privileged by the regime. Most had moved to Budapest from remote towns and villages, but many more had left their parents’ houses or a rented room to find an apartment of their own. Word spread about empty housing units. They often picked up information from their colleagues at the factory. If there were squatters in one apartment of a block, typically all the other apartments would also be occupied. They would just go and unlock semi-finished state apartments, whose construction had stopped because of the revolution, install new locks, and move in. The constitution of 1949 listed the right to proper housing among the basic rights of Hungarian citizens, and this gave justification to the squatters. “They could justly feel that the chaos surrounding the revolutionary events legitimized their decision not to wait for an official apartment allocation any more but secure housing for themselves… It seems that it also forged a shared identity for these people that they got their homes in this way” – summarizes Eszter Zsófia Tóth (2006), based on an interview with a former squatter. Even though squatters never formulated political demands of their own, the fact that thousands of people decided to break the law at the same time can be considered a form of collective advocacy. The vast majority of appropriated apartments were later officially allocated to their occupants exactly because the squatters had been active on a large scale and in a consistent manner. In many apartments of the housing estates built in the 1950s we still find families who initially came by their apartment as squatters. Workers’ hostels were an important element of the housing policy of the state socialist period. The number of people living in these subsidized hostels remained high throughout the forty years of state socialism, peaking at about 150 thousand in the late 1970s and plateauing at around 120 thousand by 1989 (Tóth, 2008). In this period those living in workers’ hostels fall into two big categories: commuters and permanent inhabitants. The members of the first group had strong ties with the countryside, which they wished to preserve, so they spent their weekends and holidays away from the hostel, in their home town or village. The second group group was made up of mostly young and undereducated men who had no other housing options in the capital and ended up at hostels permanently. They accounted for 20% of the inhabitants. We also found some anecdotal examples of individual lobbying, and cases of undermining official procedures. As one interviewee put it, “those living at the female hostel of the Újpest textile factory were luckier than others – there was one exceptionally agile activist who would keep her eye open for any emergency apartment that got given up and secured it for hostel inhabitants” (Mátyus, 1980). As for the Temporary Workers’ Hostel on Dobozi Street, which was officially a workers’ hostel, but used more as a homeless shelter (Horváth, 2008a), we found documentation of several advocacy initiatives. The minutes of a meeting with the participation of 120 inhabitants in January 1962 show that it was a real opportunity for inhabitants to articulate their needs and problems and communicate them to the management of the hostel and their mother institution, the Municipal Council. As a daily paper reported soon afterwards, the hostel “witnessed a miracle” when, rather than by infections and alcohol, it became dominated by “hard work, law and order”. As the caretaker explained, all this was the result of electing an inhabitants’ committee and a set of floor- and room-level overseers. Thus the people living tere “got up from their downtrodden state relying on their own strength and the power of the community” and painted the walls, set up a library room and started a garden. It says a lot about the hierarchy of dwellings that the caretaker formulated the difference between the former and the current state by saying “it’s not a shelter any more but a workers’ hostel” (Nóti, 1962). It seems that squatting was also used as a form of individual resistance at workers’ hostels. The squatters never organized themselves into a unified movement, and so the results remained rather limited, but if one succeeded in getting a better apartment this way, it was a motivation for the others. There are several reasons behind why advocacy in workers’ hostels never became an effective movement even though it affected more than a 100,000 people. One is the fact that living at a workers’ hostel carried a stigma and this seemed to stop residents from building up a solidarity-based network. Their demands were more easily neglected because of the stigma, which was also internalized by the inhabitants themselves. Typically inhabitants did not consider these places their homes even if they lived there for years, and were not interested in improving living conditions. Most of their efforts were directed at trying to get out of there as soon as possible. In these circumstances people found it hard to realize that they too could have recognizable needs and interests, with rights and demands attached. Also, these institutions functioned as a social buffer zone by hiding the problem of housing shortage from the general public and providing a bare minimum of a dwelling to those without housing, which effectively stopped them from fighting collectively for their needs. Those living in the state socialist housing estates were in a special position, which was often an obstacle to advocacy. One of these factors was the structure of this population. The inhabitants of housing estates were often families with a higher status and thus higher income – mainly (young) couples with small children, members of the intelligentsia, or state employees, most of them working full-time. This family structure and the relatively high overhead costs of the apartments meant that these people had to work very hard in their formal day jobs, but also around the house. As a result, they had very little time for advocacy work, and for making use of the existing community infrastructure, which could have become a forum for grassroots movements. Also, people in this social stratum were in a relatively good position when it came to getting what they wanted and protecting their own interests, which was thus mostly done on an individual level. The mid 1970s saw a change in the structure of this population, when a large number of low-income and low-status working class families were allocated apartments in housing estates as part of a social policy campaign. By getting into these apartments, they managed to achieve a higher standard of living than the majority of Hungarian society, so they had less reason to complain, and they also felt obliged to those party officials who had allocated their apartments. Since apartments were allocated in a way that was governed by one’s position in the social and workplace hierarchy as well as via personal favors, tenants were right in thinking that it was best to lay low unless they wanted to risk losing their new apartments. As József Sugár, a tenant of the large housing estate in the 15th district put it in an interview, “One shouldn’t complain, my dear. Just think about the fact that they hadn’t built over the last 100 years here in the district as many they have over the last few years” (Lipp, 1978, p 133). Contrary to popular belief, people living in housing estates were not less active when it came to participation in public affairs than elsewhere. A whole range of official infrastructure existed for inhabitants in housing estates to voice their concerns, complaints and suggestions. Tenants’ committees existed in all of the housing estates, with the declared function of channeling tenants’ complaints and ensuring the democratic functioning of the community. The committees organized meetings more or less regularly. Besides them, the Communist Youth Association and the People’s Patriotic Front were also active in housing estates and forwarded complaints directly to the local council. Overall, it has been documented that a lot more official complaints were filed from housing estates than from earlier barrack towns (Horváth, 2008b). Besides, everyday forms of resistance included the sharing of electrical appliances, illegal connecting to electricity, and making up for missing services at a grassroots level (e.g. through the tenants’ clubs). In the late 1970s a more organized form of advocacy took shape in the 15th district when the local community center was established by progressive adult education professionals. It went on to organize cultural events, publish a local paper and set up an information bureau, which became a central forum for local community life. One of the very first registered NGOs of the state socialist period, the Friends of Újpalota was also created here. They also staged political debates and started an informal seminar of political studies. At the time of the regime change in the late 1980s, this organization was crucial in advocating for the housing needs of local residents (Péterfi, 1982). For example, they set up a support fund that helped tenants buy their apartments from the local council when it became possible and they also supported the formation of tenants’ associations all over the city. One milestone was a tenant meeting in November 1989, when the inhabitants of 36 Kőrakás park be fed cameup with the proverbially useless services of the state-owned maintenance company and decided to form their own Tenants’ Association (péterfi, n. d.) to take care of their own building. Although housing construction picked up significantly during the state socialist period, it could still take 10-15 years to get an apartment allocation in the 1970s and 1980s. The number of council apartments and their quality left much to be desired, and the fact that employment was highly concentrated in cities did not help matters either. Demand still greatly outweighed supply and even the large-scale construction campaigns couldn’t keep up with it. Thus for many young couples in this period the only prospect of getting a home of their own was to build one themselves. It was relatively easy to come by a building lot: the local council would partition a given area, and equip the lots with electricity and running water, while the other utilities were added by new owners as they went along. It was not uncommon for the would-be local community to build sewage facilities, pavements and even kindergartens as a “voluntary” contribution (M. P. 1978). For a young couple, another option was to divide the plot where their parents’ house stood – if it was large enough. Planning was also cheap because the construction authorities had a ready supply of cheap, off-the-peg “type plans” available. A couple would usually build a small, one-bedroom house, which it then moved into, building the final version of the house gradually. Construction services were notoriously expensive, so many people tried to do most of the work on a DIY basis. Employers were willing to give long-term loans for the construction of these homes and the workforce was made up of friends and family members. The authorities turned a blind eye to this practice, often called kaláka. The construction of a single house could take years, mainly because of the shortage and unreliable supply of building materials. This method of home building was widespread in these decades throughout the country, but especially in the green belt of Budapest. It was typical to build a detached house for a single family, but there are also examples of entire blocks of apartments (so-called cooperative houses) being built through informal teamwork by would-be inhabitants. In these cases, the state-owned construction company often built the foundations and the walls of the house and the rest of the work was done by the future residents (Magyar, 1979, p 3). In general state-organized “volunteering” played an important role in infrastructural development during the state socialist period and grassroots initiatives for community teamwork were also widespread. Since young couples usually had to wait years for an allocated apartment and rents were too high, they organized themselves into working teams to get things done – which was not only faster, but also cheaper than the official procedure. Homelessness was never officially recognized during the decades of state socialism, which is not to say it didn’t exist. Homeless people were referred to as ’layabouts’ and later ’hobos’. There was no infrastructure to support them, with the only exception of the so-called House of Lords, a small run-down homeless shelter in Budapest with only 16 beds for men and 8 for women. The 1980s brought a deepening crisis in the lower segments of the housing system: room rents skyrocketed, workers’ hostels were closed down or transformed, and the hospitals, care homes and mental asylums that had previously taken in great numbers of homeless people now started to release them as part of a “profile cleaning” campaign. Between November 28, 1989 and the winter of 1990 there were three waves of protests organized by homeless people and their supporters in three hotspots of Budapest. Two of these hotspots were railway stations, and the immediate cause of the protest was the authorities’ decision to lock the station premises up for the night to stop homeless people from sleeping rough on the benches – as had been done for many years. On November 28, 1989 homeless people started a spontaneous sit-in and on December 21, 1990 the National Poor People’s Front (NPPF) led by actor András Nagy Bandó and Árpád Balogh was founded with 157 members and. The protesters at Blaha Lujza Square demanded that the empty premises of the socialist party be turned into housing facilities and shelters for the homeless. The NPPF formulated similar demands at the Déli (Southern) railway station, with a somewhat higher degree of organization (Mihályfi, 1994). A statement issued by the head of the Budapest police force declared that homelessness was not a law-enforcement issue, but a social one, thus no police intervention was to be expected (Romhányi, 2010). Participants initially won the sympathy and appreciation of passers-by, which gradually turned into rejection as the squalor that came with the sit-in became permanent. The protesters finally agreed to go into the temporary shelters offered by the authorities (as opposed to the subsidized renting scheme and employment they had initially demanded), and the protest lost its footing and petered out. One group of protestors was first sheltered in a gym of a primary school on the outskirts of Budapest and later taken to a shelter in the 8th district, with many of them going back to sleeping rough as spring arrived. The group protesting at the Déli railway station was taken to the premises of the former pioneer camp in the Buda hills and then to a former military barracks in a nearby town. Life here was initially formalized and organized at the grassroots level by the residents themselves, but this role was later taken over by the professional social workers. The next and last leg of this protest movement took place in the winter of 1990-91, but this was less sweeping than the first two and participants were more easily silenced. The root of the conflict was again the denial of access to railway stations. The National Council of Underprivileged People registered a permanent demonstration from September to December at the Déli railway station. The police banned the demonstration and the railway company wanted to lock up the building for the night as of November 1. As a result, a group of homeless activists occupied parts of the Keleti (Eastern) railway station, causing railway employees to go on strike and demand that the police remove the protesters from the premises. The stand-off was resolved when the railway company volunteered to turn some of its buildings into temporary homeless shelters and the municipal authorities also expanded their existing facilities (Udvarhelyi, 2014). The demonstrations of 1989-90 were a milestone in the history of housing movements in Hungary because they were the first example of homeless people and their allies actually forcing authorities to acknowledge the existence of the problem and allocate resources to tackle it. However, it also became clear that beyond addressing the most immediate crisis there was no political impetus to solve the problem of homelessness. The temporary shelters established at the time lay the foundations of a system that has been in existence ever since, and which has only served to make the problem permanent. It is an important achievement that these facilities exist at all, but they do nothing to address the underlying socio-economic causes of homelessness. The large-scale subsidized housing system was a major source of political legitimacy for state socialism (Barta–Vukovich, 1983; Ferge, 2002). However, throughout the 1970s and 1980s, subsidies started to decrease and more and more workers’ hostels disappeared. Towards the end of the 1980s the number of evictions was on the rise and homelessness became ever more visible. Housing policy reform was one of the most burning issues of the regime change and there was great pressure on authorities to allow large-scale privatization. The first big wave of privatization took place between 1990 and 1995, when out of 703,000 publicly owned apartments 419,000 were sold to tenants (Petz, n. d.). After this, only few units remained in public ownership and these were typically the most run-down ones. The late 1980s had seen the emergence of a large tenants’ movement in Hungary, which can be traced to several sources. One was the notoriously negligent attitude of state-run property maintenance companies. In the late 1980s 80% of the housing property stock was owner-occupied and 20% state-owned. The maintenance of state-owned apartments was the responsibility of the Property Maintenance Company (IKV), a proverbially badly run and poorly organized company. 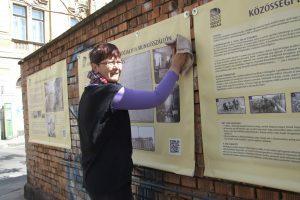 To address the tasks neglected by the IKV, a small tenant movement was launched in Budapest in 1983 where the state graciously allowed tenants to dedicate their free time the maintenance of their properties. By 1989 there were about 200 such tenants’ communities, the largest number of them in the most prosperous 2nd district. Their functioning was officially sanctioned by a city council decision in 1982 (Sebestyén, 1983), but it is hard to judge to what extent their functioning was centralized and directed from above. The IKV subtracted the work put in by the tenants from the maintenance fee they had to pay for their housing. In 1988 the Tenants’ Association (LABE) was officially established. Its declared goal was to engage in advocacy to make sure tenants’ interests were represented throughout the housing policy reform (A Lakásbérlők Egyesületéről, 1989). Two of their most important topics was putting an end to the monopoly of the IKV in housing maintenance and setting up self-governing tenants’ associations all over the city. Their central project was supporting the establishment of a network of these associations, developing the legal and professional framework for their functioning and getting the model off the ground. This model was based on the premise that properties could remain council-owned, but all maintenance would be the responsibility of the tenants. Another central premise was that all of the associations would be based on the active self-organizing of stakeholders. For a moment it seemed that this model could be successful, and in 1989 the Parliament passed legislation to legalize the establishment of autonomous tenants’ associations. Even though LABE-backed politicians became members of several municipal boards, they weren’t powerful enough to stop the transformation of housing policy in a way that they regarded harmful. When new legislation in 1994 ensured that a great number of public housing units were privatized, the association lost its footing as more and more tenants became owners. Had the self-governing tenants’ association model been successfully introduced, the entire history of housing policy would have taken a different turn. While LABE remained convinced that without a significant pool of public housing there can be no successful housing policy, they failed at stopping the process of large-scale privatization and the loss of community-owned property to private interests. All this happened despite their significant mobilization potential and community support. How was this paper written? This overview was written in an unusual fashion. The toughest part of the work undertaken by the team was writing. Our group is diverse: some of us are more able and willing to write than others, who may spend hours staring at the screen without coming up with a single sentence. Some keep deadlines, while others have nothing to do with them. By April 2015, however, there was no compromise: each team member had to write a summary of what they had done until that point. Luckily, the more experienced team members insisted on this one task and this was a very useful experience. It was certainly true that whatever doesn’t get written down gets lost and many of us now regret having been too lazy at certain points to write some things down. A lot of valuable information may have been lost this way. But then, in the autumn of 2015, there was a second round of summary writing, to which almost every one of us contributed, even if with great difficulties. At this point we were incorporating the materials we had found for the past six months into the existing presentations and papers, which, even to our own surprise, were becoming more and more complete in front our very eyes. This paper is the result of the strict discipline we exercised for these two presentation deadlines. This paper was originally published in the periodical called Kovász, which all team members thought was a good idea. However, the exact way to do this was not yet decided, while the deadline was creeping up on us. In the end, each topic was written up by a different author as the essence of our long and hard work. It simply couldn’t have been written by any one of us alone, since each team member was exploring a different topic with one shared element: problems of housing. When thinking about our team, one can see a varied, colorful and even mismatched lot. The team’s draft horses started pulling our collective weight. Tessza got down to sculpting a unified whole out of the raw materials produced by a team of prancing fillies, parade mounts and blinkered mining horses. She ended up with 54 pages of text, which she refused to edit. So her place was taken by the next draft horse on the team, Andrea, who mercilessly edited out entire paragraphs, deleted lines and did away with ungainly remarks addressed at other team members. When she reached the end, she started all over again, until she ended up with 36 pages. At this point the editors at Kovász helped us trim the text even further – and here we are! At the School of Public Life, we take participatory action research seriously – all three components of it: 1) the goal of the research is to gain information on a previously unexplored issue or an issue presented in a distorted way, 2) members of the group immediately affected by the issue participate in the research and 3) we take active steps to change the situation we are not satisfied with. In our research project, the intention to make change was present at three levels. One was to get the message about our research to as many people living in housing poverty as possible and to inspire them to use examples from the past as a model for organizing themselves today. Another level was the sphere of academia and the established circles of social science, where we wished to raise the awareness of social scientists regarding the value of directly affected people taking part in research about housing poverty. The third level consists of us, the researchers, who have also changed as we learned about ourselves and the world. In order to achieve our first goal, we compiled a travelling exhibition that presented the grassroots housing movements described in this paper on 12 portable panels. It was on display in several social welfare and homeless institutions and at each venue we also held a workshop with social workers, clients and visitors, where we talked about the research process and the lessons we had learnt. During the discussions we used several methods – at some venues we explored the exhibited materials with the help of a treasure hunt, while at others the main focus was on the housing problems of workshop participants and what we could do to solve them. At yet another venue, we showed short films about the movements we have discovered and discussed them together. In a Jewish community center, the focus was on the history of Jewish-related housing movements. At one venue – in a family support center –members even started to discuss ways and means of organizing themselves together with the social workers. After our tour in Budapest, the exhibition went permanently on display for more than a year on the front wall of the Aurora community center in the 8th district of Budapest, where it could reach those who are most severely affected by housing poverty in the city today. Apart from the exhibitions and workshops, we also participated in a number of roundtable discussions, where we shared our findings and the lessons with others. One outstanding example is the summer university jointly organized by The City Is for All and the School of Public Life, where we discussed the question the most successful housing movements of the past and shared their key components of success to member of the audience, many of whom were housing activists themselves. The goal of this discussion was to enable participants to learn from the mistakes and successes of the past and incorporate these into their present-day activism. Some of the most important elements of success included the connection of the movements to larger economic and/or political transitions, the establishment of a broad social base, the creation of strong interclass alliances, and, last but not least the use of more radical methods. Indeed, since the research, we have been trying to incorporate these findings into the work of the City Is for All and its sister organizations. Having created the travelling exhibition, we started to work on a permanent exhibition to be housed at the Kassák Museum in Budapest. 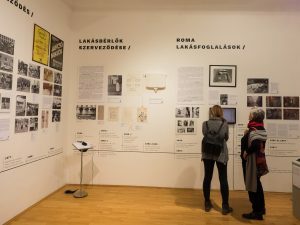 While the travelling exhibition was mainly meant for people who have first-hand experiences of homelessness and housing poverty, the museum exhibition, which opened in early 2017 targeted a mostly middle-class audience, whose members may also be invited as allies of an emerging housing movement in Hungary. Apart from the exhibitions, we tried to get our findings to people living in housing poverty and their allies in print as well. For example, the September, 2016 issue of our free magazine “Feketemosó” featured a summary of the travelling exhibition in an easily accessible format and language. The magazine was distributed at the Sixth March for the Right to Housing organized by the City is for All, which had nearly 1,000 marchers. Having experienced the often patronizing attitude of academics, who tend to consider people affected by social exclusion as objects of their study rather than active participants, we made an effort to participate in events organized in the academic sphere such as academic conferences. A report about our research was published in an academic journal, Kovász, to get our message to the widest possible audience of academics working in the social sciences. Our message is loud and clear: Nothing About Us Without Us! Appadurai, A. (2006): The right to research; Globalisation, Societies and Education 4 (2), 167–177. Barta B. – Vukovich Gy. (1983): A lakáshelyzet alakulása és jellemzői; in. Böröczfy F. (szerk. ): Lakáspolitikánkról; Kossuth Könyvkiadó, Budapest, 204–220. Billies, M. (2010): PAR method. Journey to a participatory conscientization; International Review of Qualitative Research 3 (3), 355–376. Horváth S. (2008a): Csavargók, hajléktalanok, koldusok. A társadalmi gondoskodás rejtett gyakorlata Budapesten az 1960-as években; Történelmi Szemle 50 (3), 362–381. Horváth S. (2008b): A lakótelepek népe és a bűn metaforái; in. N. Kovács T. (szerk. ): A modernitás laboratóriumai; Kijárat Kiadó, Budapest, 63–83. Kassák L. (1983): Angyalföld; in. Kassák Lajos válogatott művei I-II. Széppróza, dráma; Szépirodalmi Könyvkiadó, Budapest, 378–685. A Lakásbérlők Egyesületéről (1989): Eszmélet 1 (1), 113–117. Magyar L. (1979): A „hírős város“ bizonyít; Népszava, január 5., 3. o.
P. (1987): Tégláról téglára; Népszava, október 19., 3. o.
Nagy-Csere, Á. (2010): Nyomortelepből mintalakótelep. Szocialista városrehabilitáció vagy a szegények fegyelmezése? ; Korall 11 (40), 45–67. Nóti I. (1962): Csoda a Doboziban; Esti Hírlap, április 24. (péterfi) (n. d.): Zendülés a Kőrakás Parkban; h. n.
Petz R. (n. d..): Kérdőjelek a szociális bérlakások körül; GKI Gazdaságkutató Zrt. Sebestyén T. (1983): A bérlőközösségek szervezési szempontjai. Országos műszaki-szervezési tájékoztató és tapasztalatcsere előadásai; ÉVM-5.sz Fenntartási építés fejlesztése ágazati célprogram bizottság, 77–82. Szécsi J. ( 1963): Pesti nyomorgyűrű; in. Gondos E. (szerk. ): A valóság vonzásában. Tanulmányok, riportok, elbeszélések; I. kötet, Szépirodalmi Könyvkiadó, Budapest, 309–316. Szélpál Á. (1936): Földalatti város; Népszava, január 19., 20. o.
Tóth E. Zs. (2006): Munkások és munkásnők ’56-os megéléstörténetei; Múltunk 4, 250–267. Tuckman, B. W. (1965): Developmental sequence in small groups; Psychological Bulletin 63, 384–399. Young Gypsy man (in Lakos, 1985, p. 214–215.). German-speaking population in Hungary who moved there in the 18th century. Officially called the Austro-Hungarian Compromise of 1867, which created a dual monarchy between Hungary and Austria, thus restoring the soveregnity of the Hungarian kingdom, which was terminated after the 1848/1849 Revolution. Kaláka is a traditional form of collective work that has deep roots in Hungarian peasant culture. It is based on long-term reciprocity and involved collective entertainment besides collective work.